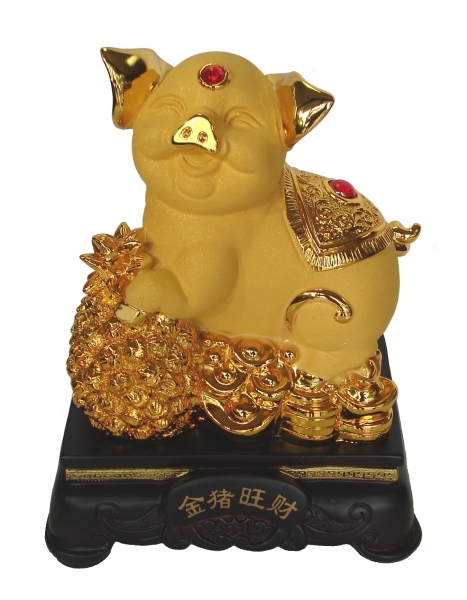 This 8" beautiful rubber finish golden pig statue is stepping beds of Chinese coins and pineapple. Since Chinese coins and ingots are the symbol of wealth whilst pineapple represents good omen and good luck, this noble pig statue can bring auspicious energy in for Chinese lunar year of pig. The Chinese words on the stand are "Jin Zhu Wang Cai" that stands for Golden Pig Booming Wealth. It comes with one nice gift box. The overall dimension of this whole pig statue is approx. 6.25"(L) x 4.5"(W) x 8"(H). It is made of resin.